Man, thought Rudy had this one in the bag. 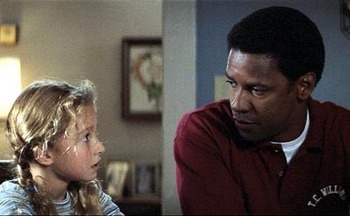 Alas, such is the power of Denzel. Haven’t seen this one in ages and for some reason the only thing I can really remember is that kid named “Sunshine”. Sounds like I need to revisit this. Swell voting, folks. Just glorious. – Other: 2 votes for North Dallas Forty (even more Burt Reynolds mustachioed goodness), 1 vote for Little Giants (no idea why there aren’t more movies with Rick Moranis and Al Bundy), 1 vote for Invincible (not bad), 1 vote for Necessary Roughness (never seen it), 1 vote for MASH (? ), 1 vote for The Best of Times (that you Lemon Meringue Copter? ), 1 vote for Dodgeball (almost? ), and 1 vote for A Leauge of Their Own (not even close). Sentimental but oh so good! Nice to see Remember The Titans top the vote! hahaha. think you need to write up a review after that statement. Aiden, you nailed me! Not only can you review movies with the best of them, you’re psychic too. Have you seen Best of Times? Classic, nostalgic and very funny. hahaha. yeah, i remember you and pete were on a big Best of Times kick a few years back and I ended up renting it as result. liked it, but not as much as you did, but it also seems like one of those movies that’s better to watch with people who like it and start laughing when Kurt Russell comes out onto the field in his white shoes. will watch it again. The “Other” list is quite humorous. Gotta agree with Titans, though. Still get shivers down my spine during a few parts. Varsity Blues will always hold a special place in my heart, though. “10!! A mother-******* 10!! Hahaha. Can’t say I’ve actually sat through all of Varsity Blues, and the extent I’ve watched was all on TV, so this who MF bomb is news to me. GOTTA see it now! We watched that movie religiously in high school. And the Thunderstruck sequence is easily one of the most influential scenes on all of sports. Thunderstruck was later named the best song to listen to while preparing for a game, and our football team made it a priority that Thunderstruck was the last song we listened to before we left for the field. great list. I think Remember the Titans could very well could be the best football movie of all time, but there are so many good ones out there. You can’t argue with the voters though.